While Intel spent the majority of its stage time at GDC 2019 announcing new software and 9th Generation mobile processors, the company also gave us a small tease of what its graphics card could look like. 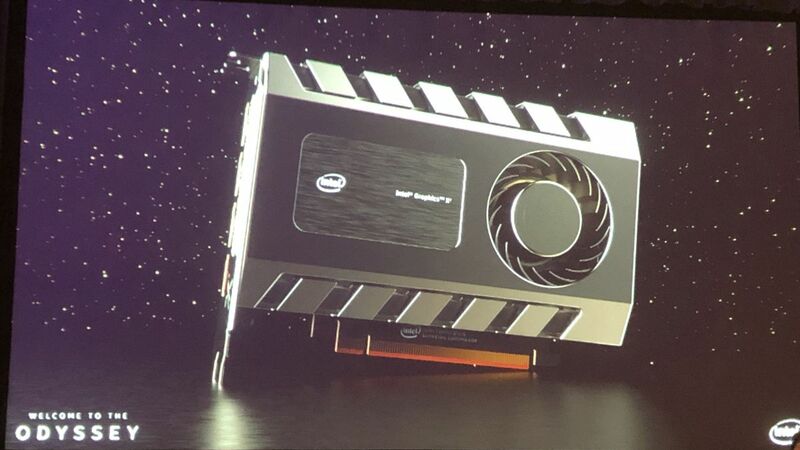 At the very start of its GDC 2019 keynote, Intel designer and artist Christiano Siquera shared the very first shroud design for an Intel Graphics Card. This design you see below was apparently published back in December 2018 and while it looks like any old, generic mini GPU, Team Blue has since moved onto a new design. On the next slide above is Intel’s new new shroud design with an aesthetic very similar to the company’s recent Intel Optane SSDs. Between the flared, diagonal lines and the angular look, this graphics card basically looks like a shorter, bulker version of the Intel Optane SSD 905P. Intel’s first graphics card also seems destined to utilize a single fan, blower-style cooler based on these images. Unfortunately, there’s little else to speculate on aside from these observations. As these are just renders and Siquera noted that he’s working on nine additional designs, so this likely won’t be the final form of Intel’s future graphics card. In 2018, Which Gaming System is Right For You? April 20, 2018 Comments Off on In 2018, Which Gaming System is Right For You?